This is a beautifully illustrated Bible. 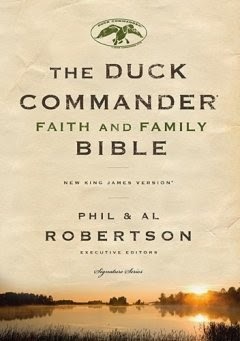 It's filled with stories of true, life experiences by Phil and Al Robertson. These stories are full of their core values. It's so easy to read and get lost in. They have such a passion for just being real, sharing their hearts, the good experiences and the bad. Every situation, whether good or bad, is turned into giving God the glory! As for the Bible its self, I found it to be pretty typical of the NKJV. I would highly recommend this Bible. If you love the Robertsons, as our household does, you'll love it! It's a great help in dealing with every day situations and life in general.